It’s probably impossible to imagine having one’s daughter, still in braces and perhaps having just entered that awkward period of puberty, snatched away without warning — gone in an instance and with little hopes of every seeing her again. But that’s what happened to scores of Nigerian families when nearly five years ago (April 14, 2016), 276 Nigerian schoolgirls in the country’s Chibok province, days away from taking their exams, suddenly became captives of the Islamic terrorist group Boko Haram after being kidnapped during the night. Some of the girls, fully aware that if they survived, they’d be forced into lives as slaves or concubines, somehow summoned the courage and ingenuity to escape — leaping from moving trucks as they sped through the forests. Others would eventually be released by their captors. But five years later, 112 of the girls still remain missing — presumably lost forever and torn from families and friends whose lives have never been the same. 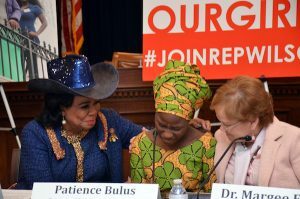 And as a means of remembering those still in captivity and to applaud the efforts of former Chibok girls, now young women, who continue to rebuild their lives, Rep. Frederica Wilson (D-Fla.) hosted a panel discussion wrought with emotion on Capitol Hill, Tuesday, April 9. The discussion, which featured two of Wilson’s colleagues both of whom have traveled with Wilson to Nigeria and supported her initiatives from the start, Rep. Lois Frankel (D-Fla.) and Rep. Sheila Jackson Lee (D-Texas), also included two educators, Dickinson College president and international visiting scholar, Dr. Margee Ensign and Dr. Jacob Udo-Udo Jacob, respectively. Jacob serves as the academic director for Dickinson’s Bridge Program which assists displaced students from other countries whose education has been interrupted due to war or natural disasters and prepares them for the academic challenges they must face upon their matriculation in American colleges. Patience Bulus, one-of-four Chibok young women currently enrolled in the Bridge Program, began her studies in April 2018) and joined the speakers, reflecting on her painful past, the changes she’s tackled since coming to the U.S. and her plans for the future. “So many girls have been forced to obey Boko Haram, no longer free and without a voice,” she said. “Many have no way of knowing if those still missing are even alive. I know a lot of parents who have died from broken hearts. Even after escaping and being fortunate to come to America in 2014, I had more sadness to overcome as my mother and then my father died within months of each other,” she said through tears that come with such force that Wilson temporarily halted the forum so that she could be consoled. “It’s important that leaders of the world do more to fight terrorism. They should also make education free for all who desire it. Most important, I hope and pray that you will not turn your backs on the many refugees who continue to come to America seeking a better life. As for me and my other friends from Chibok, I ask that you never forget us. I owe so much to Congresswoman Wilson and her colleagues who have opened doors and changed my life for the better forever. One day, I want to become a counselor so I also help others, especially youth like me,” said Patience, displaying her competency of a language completely foreign to her upon her arrival to America’s shores five years earlier. Ensign, formerly employed as president of the American University of Nigeria, emphasized the significance of education as the primary means of overcoming poverty and oppression, particularly for young girls like Patience.